September is National Preparedness Month, and the best way to prepare is to first understand your risk and take action in advance of an emergency. By signing up for Smart911 and giving emergency responders details about members of your household, the location and description of your home and notes like emergency contacts and medical conditions, you are providing information that can save value time during an emergency. Make an emergency plan for yourself and your family. Sign up for alerts and warnings with Rave Alerts through Smart911. These are all steps you can take now to help yourself and loved ones to be prepared in the event of a disaster. Prepare an emergency kit with enough food, water and other supplies to last at least 72 hours. 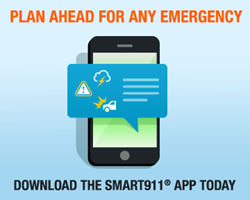 Stay informed by signing up for emergency alerts with Rave Alerts through Smart911. You can also receive up to date information by following local public safety agencies on Facebook and Twitter. 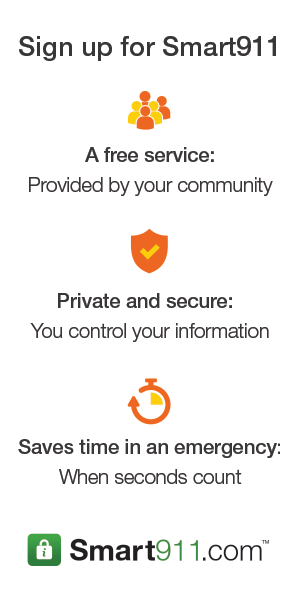 Sign up and create a Safety Profile at www.smart911.com to provide any information about your family and household that you want 9-1-1 call takers and first responders to know in an emergency. This information can save valuable seconds or even minutes in response time.